This Page contains background on the recording of The Circle Path, Lyrics, Art, and how to order. Any support you give is greatly appreciated. Thank you for giving us your time. 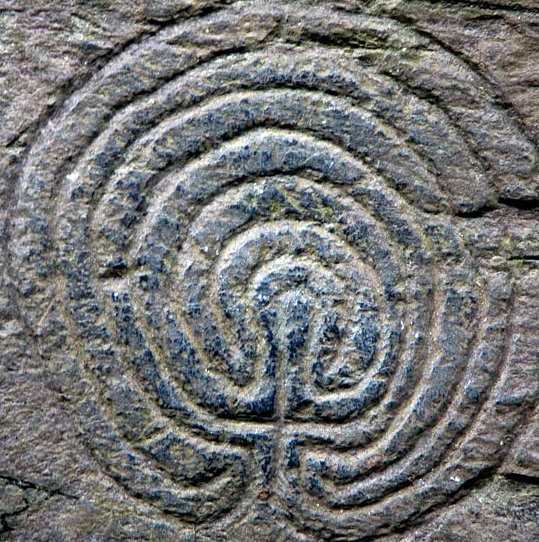 Inspired by the labyrinth around Glastonbury Tor, this original modern folk collection follows the cycles of life and beyond to the realization that we are the journey, not the destination, on the Circle Path. 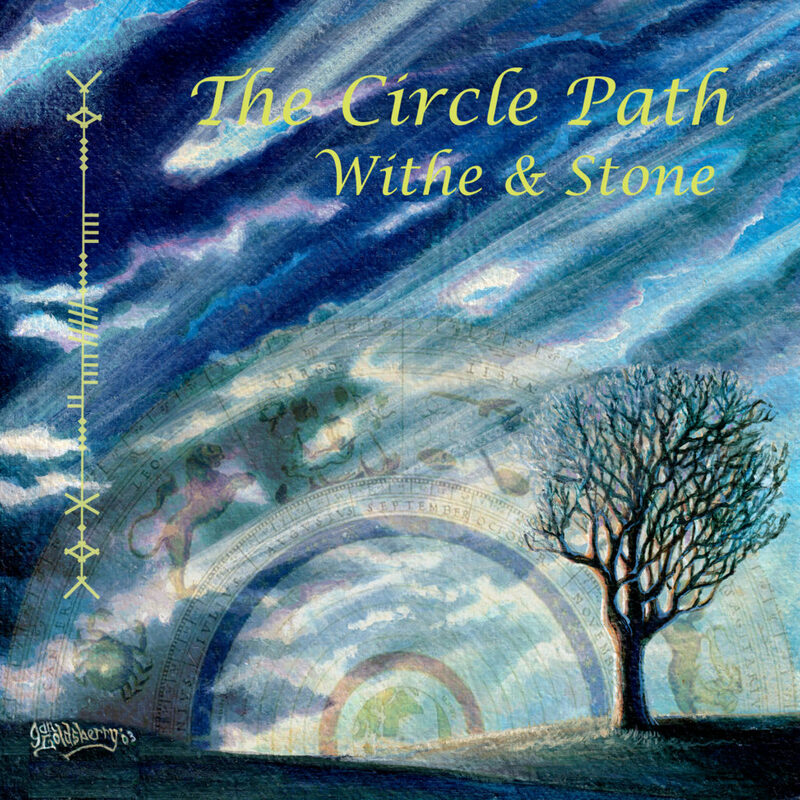 Performed by John Corbin Goldsberry on a variety of instruments like Guitar, Mandolin, Hammer Dulcimer and some like the string drum and the Humblebee he invented for this project, The Circle Path is that journey, following the death of his songwriter wife , blending mysticism and the struggles of the life path that all of us face. While deeply personal, it is at once accessible to all who undertake the climb to the epiphany of our existence. Withe and Stone on Spotify ! 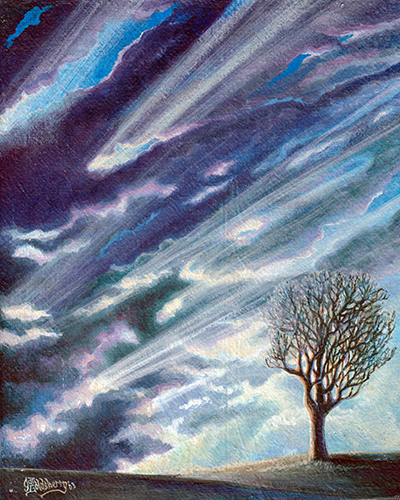 The inspiration for the cover came from this painting of Jan’s called “Solace” I had to crop it down for the cover, so I wanted to show it properly, full size, without the graphics. Even her title seemed appropriate. Jan and I made several trips to England together. One of my favorite experiences was climbing the 4000 or so year old labyrinth to the top of Glastonbury Tor. I had a dream that I had accompanied her when she was a Priestess to an enclave there. While the males ringed the bottom, the women progressed up the switchback path to a stone circle at the top. It’s hard to see now and some say it isn’t really there, but that doesn’t detour many each year from taking this spiritual quest. It was the inspiration for the Circle Path. Jan snapped this of me on our ascent. It’s the back of the CD. 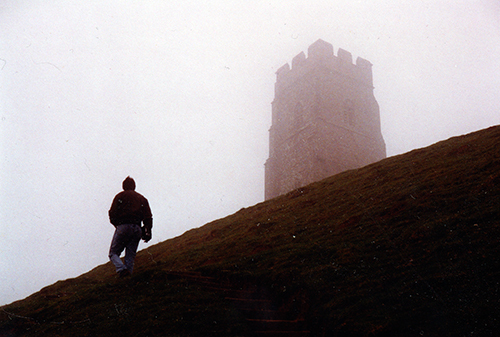 I wrote this in summer of 1997 while musing over the climb around the labyrinth on Glastonbury tor Jan and I had taken one foggy morning in 1989. We were both feeling homesick for a place we had never lived, in this lifetime anyway. It languished in a file box for years until we started to lay out The Circle Path, and it occurred to me that this might be a great way to set the tone for this collection. I used to have a wire strung harp that sounded much like this, but sold it several years age, as musicians do, to pay bills during the lean times. I played it here on an old Dusty Strings Dulcetta Hammered Dulcimer, a very small instrument, and was pleased at how well it sounded. I also used handmade Mideastern sheep bells I picked up back in the 70’s sometime. The traveler sat on a rock, and pushed back a lock of unruly hair and stared up at the night sky. The stars set amidst the blackness shone brightly, each one a messenger of hope, each one with a voice, a blessing. It was quiet here, with only the sound of the wind in the grass. Somewhere in this land’s memory he heard sheep bells. The small harp on his back caught the breeze and the wire strings hummed, seemingly eager to join the memories. He could feel his need to reply and he pulled the harp from over his shoulder and placed it on his leg, one cheek resting on its carved side. His fingers danced lightly on the bronze of the strings playing, not a familiar tune, but one from the beating heart of the earth, it’s endless font of grace and beauty. It wasn’t so much inspiration as supplication, playing tunes of the angels, lifting his prayers with each note, one for each soul he had met. Those whom had helped him along his difficult odyssey, for those he had cared for, those with no voice to speak up with, for the forgotten ones, for the ones with hands out pleading only for love, the one thing there is no short supply of, for those whom had thrown themselves from grace and had yet to discover it always follows you, for all his friends distant in time and space who, before and after, trod this same path through the wilderness, the moors, the forest, the mountains, the shore. Shaman, Merlins, Bards, Saints, Poets, Dreamers all. There was always one to tread the path, there had always been. Sometimes many, sometimes one, but though the grass grew tall and threatened to obliterate it, it could never be lost if there was one willing to walk it. Two lights caught his eye in the valley below, a car speeding down the empty road on its rush from here to there. He knew they could not see him, or the stars, or hear the wind or the music. They were unaware of all but there destination, the culmination of there dreams, the goal, never realizing tell it’s over that the journey is the most important part, the questions, not the answers are what make us who we are. So one more blessing goes out then for those who do not see, as he shouldered his harp, walked slowly down the hill, and crossed the highway. Walking into the first light of morning he smiled and thought of those who travel past him. They would meet again, for although there road slices thorough his arrow straight on its way to the sea, his is a circle which all must eventually walk. Jan said this one came to her in a dream. she was walking down a path made of stones, and in between lights were coursing around. At any junction where two met they would burst in intensity for a moment then move on. She woke up and scribbled the whole thing down while I was at work. She sang it to me and It immediately became one of my favorite tunes. How we live the life that we choose. 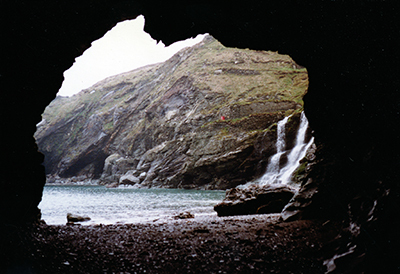 Jan and I and Three of our kids had the privilege of spending the summer 1998 in a little, and sadly, no longer existing theme park just outside of St. Columb in Cornwall England. Just next door was an Iron age hill fort, and on a trip there I was struck by the vision of different events in time all happening concurrently, and felt I was a personal observer to all of them, even though I had no words to explain it all. The experience stuck with me and I wrote this a couple of years latter. I lay him in the ground like the crops I should have sown. What dies and what lives on, It’s not the future that we fear. We’ve plowed the earth, mined her wealth, we’ve fished out of the sea. Before we were married, Jan and I took a trip to England. I Had been there before but she had not. On our first night we ended up at Arundel and when Jan got out of the car and saw at the end of the street her first real castle, as opposed to a Disney one, the reality of where she was made her literally dance in the middle of the road. Years latter that image was the beginnings of these lyrics. At one time in a fit of despondency, I through them out, but Jan fished them out of the trash, made a few minor changes, wrote a tune for it, and told me it was her favorite thing I had ever done. She made me see the significance of what I had written. It became the spoke for the wheel of this whole collection. Theses well-trod roads just leave me cold. Oh, the faces change in every breath we take. One more time round this mountain, the way I used to jest. Now I see the spiral footpath I must make . We picked up a book one time of poetry from Christina Rossetti, a Victorian Poet and Brother to Dante Gabriel Rossetti. , the Pre-Raphaelite painter, from whose interest Jan had led her to Cristina. She felt a deep infinity to her and could see her sitting at a desk next to an open window onto a garden, the sound of distant children’s laughter and birdsong, writing these words. This inspired her to write the melody, I think the most beautiful she ever composed. Her dream was to hear one of the English cathedral choirs sing it. Some day I hope one chooses to. These are Christina’s original words which Jan altered only slightly to be more lyrical. I can’t think of any particular event that triggered this lyric, other than general frustration at not working at music at the time, and being overwhelmed with adult life. Jan added the twinkle little star part in the middle which was voiced by me and a whole lot of plugins. Singing songs with the man on the moon. I must confess, that even though Jan put this down in the track listings as a possible song for this collection, I never payed that much attention to it. It wasn’t tell after her death when I realized it was never even typed out, but only existed as the fragments of two old song of hers she had combined, that I knew I had to act. I had to add one line to make it come out right, as she never finished one verse, but the result floored me. She told me the story I needed to hear in my grief. I am still here. The story isn’t over. Or close his eyes to find that he, just like an old memory slips away. He thinks he’d finally have the answer to keep away the darkness when it comes. Caribbean Bluegrass, is what comes to mind. This is Jan all over. The bridge is what really sets it off. She wrote this before I ever met her. It’s been locked away far to long. Cardinals on scarlet wings, happy songs I love to sing. As much as this sounds like I wrote a lament for my wife, She penned this after having to come back from England. We were trying to move there permanently, but alas, it was not to be. 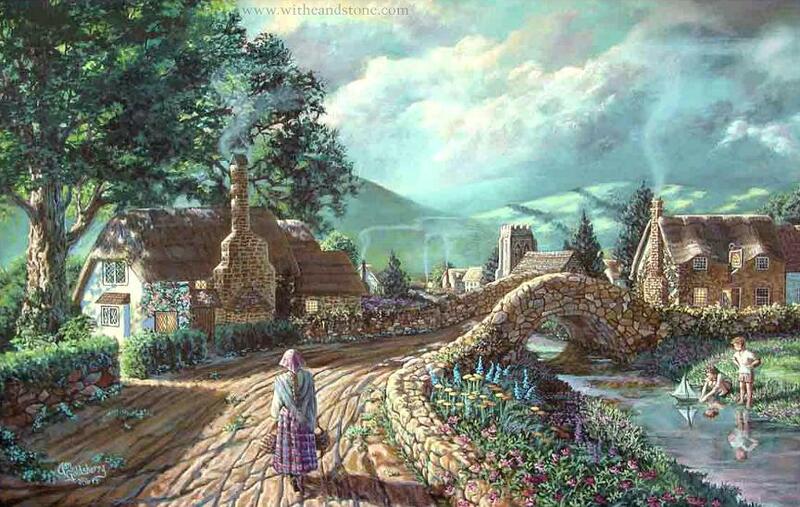 In latter years she saw it not as England itself, but separation from what she saw as an idealized village, filled with music, laughter, love and creativity which she named Withe & Stone, hence the land I now inhabit. I see you when I close my eyes, the heartstrings forever straining. To reach you the longing lingers on , a bittersweet song refraining. Chorus: Without you I never feel at home , I feel alone wherever I am. As I was mixing songs down for this, and missing Jan and her wisdom and producing input, I went to bed one night and had a long dream. In the dream I heard the voice of Isabella. I have to back track just a bit. About two months before she passed, Jan and I were both having a lot of breakthroughs in our lives and confronting a lot of obstacles we had been carrying with us our whole lives. It was incredibly cathartic. I had dreamed that my body sloughed off leaving a small boy with raven wing hair and emerald green eyes. She congratulated me on finally meeting my inner child. We called him Corbie, from my middle name meaning crow, and the obvious reference from his hair. 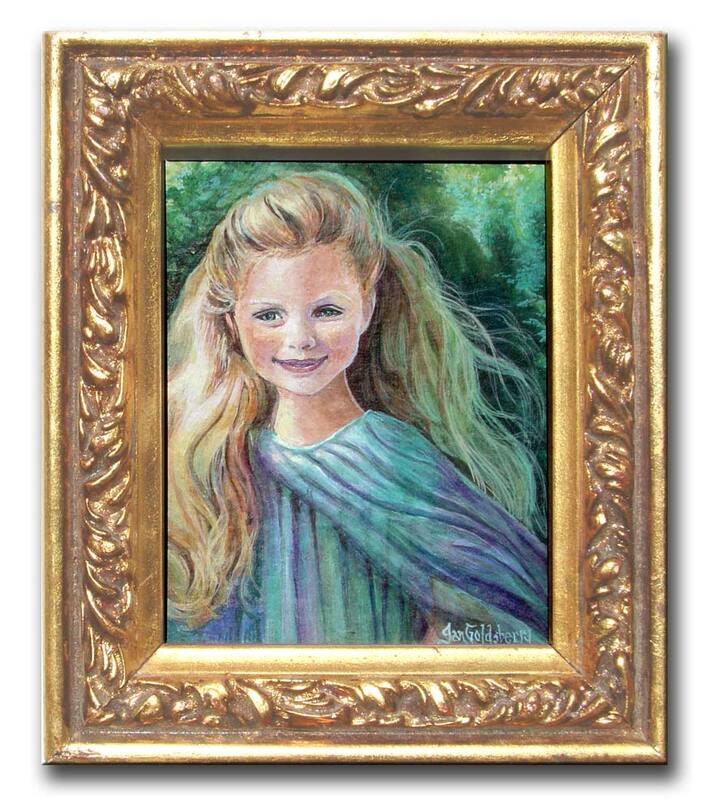 She showed me a picture she had painted called “Isabella in Sunshine”, and said that that was her inner child. She thought the two were great friends. She also felt that we both would be moving on from this plain of existence around November the first. “This is who we can be there,” she said, “whenever we want too.” She died two weeks latter and I’m still here whatever that means. So in the dream Bella plays for me all these songs, but in reverse order to what she had originally wrote. The songs became clips, like we were moving backwards in our journey. Finally, it ended up with individual phrases that, in her voice, made a coherent message. I woke up from this dream and ran to the front room, Spread the lyrics out on the floor and cried. There it was. Just like in the dream . Bella’s voice rang in my ears. I finally felt all the grief and joy rolled in one come spilling out. She knew it was there, just what I needed to hear in the way it needed to come out. It was what all of this had boiled down too, the reason these songs had to be put down the way they were, the reason I needed to record them. I immediately started to record what I had heard and knew exactly how and where to put it. Maybe I’m nuts, or just maybe, shes still here, and this existence is not what it seems. Whatever your beliefs are, here is Bella’s message. Don’t forget, wherever I am, in and out of time we stay as one. For the story’s still revolving round the circle and, singing songs, where on such minstrels play, when everything is done and said, our pathways unmarked, are always connected. We will meet again, for all your friends, distant in time and space, can never be lost. This short piece was from Jan’s notebook. She started it as a song lyric, but let her mind go and wrote down her impressions as she went. It seemed fitting as I could not record her reading it, to have the voices of some of her children and grandchildren read it instead. Mosaic patterns of green and gold, Sunlight dancing on the leaves, sparkling crystal azure air, clouds and wings accented by the breeze. Warm breath of basking earth, ambrosia scented waves lift to be inhaled and infused and disturb the stagnant slumber of my natural heart, my inner eye, stirring the memory of some other place just on the fringes of my deliberate mind. It’s okay then. I’m suddenly still and at peace. I almost don’t breathe, wary of frightening this bliss like some fragile bird feeding in my garden. At once I know just where I am, what land the sun is lighting, and at the same time I realize it’s not of this earth, or is it? Some hidden realm I don’t remember visiting, or some present view reflected through another’s eyes. This was going to be Jan’s closing for the cycle. I find myself singing it to say goodbye, and at the same time I hear her singing it for me. I guess thats how spirit works. I had no music from her, so I just closed my eyes and this is what came out.